Before we get started, I wanted to throw in a tip, for making this salad that much "more", so you'll acheive full flavor and creaminess! 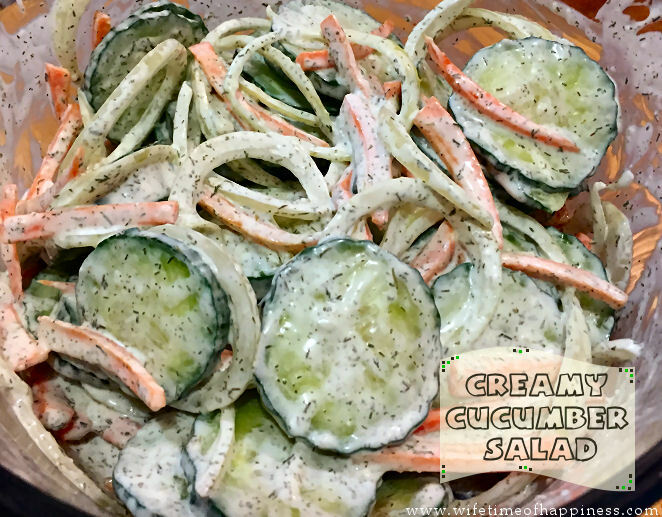 A few hours before, I like to do the "prep work", (which honestly is no work at all – But it does help aid in the crispness of the salad), slice cucumber, tossing with just a bit of salt. Put the cucumbers into a container, followed by a paper towel on top. Now make sure your ziplock is sealed tightly and put into the fridge. The salt will help draw out a lot of the moisture in the cucumber that will make your salad very watery. Your paper towel will be wet, a few hours later! Alternatively, you could just seed the cucumber and throw it in the salad that way. Whichever your preference is fine! Whisk together the mayo, white vinegar, sour cream and spices. Pour over veggies, mix until well combined. I like to add a few cracks of fresh ground pepper. Chill in fridge for at least one hour – Enjoy!